Sail around the Whitsundays and explore Fraser Island! The 4 Day Whitsunday Adventurer and Dropbears Fraser Island Tour will allow you to sail and stay in the Whitsundays on board a comfortable catamaran and also explore and drive around the world's largest sand island on one of the funnest tours for the ultimate 4 days of adventure! Everything you will need is covered, including meals, activities, and marine park fees. All you need to do is get yourself from one location to the next, choosing to do your 4 day tour in whatever order you want. Whitsunday Adventurer is a stylish catamaran that sails around the Whitsunday Islands off the east coast of Australia. The 2 day, 2 night tour includes all meals, snorkel equipment, use of paddleboards, kayaks and the onboard fresh-water spa! This tour attracts a wide variety of travellers, including couples, families and solo explorers, making it a great place to meet new people and expand your horizons while you get to see the beauty of the Whitsundays. Guests on board Whitsunday Adventurer will get to enjoy the best of the Whitsunday Islands. They will get to visit the amazing Whitehaven Beach and Hill Inlet Lookout, and also partake in plenty of amazing snorkelling. The Whitsunday Islands are known for the amazing fringing reefs that surround the islands with their diverse coral and abundant marine life, where you will get to discover all the the beauty that lies below the surface of the ocean. Guests can also use the kayaks and paddleboards along the edge of the reefs and around the boat to take in the stunning views and warm weather. You will have plenty of time for exploring and relaxing and will have everything you need for your two days on the water. Whitsunday Adventurer provides the perfect place to meet new people, form everlasting memories and discover the best of the stunning Whitsundays. Dropbears Adventure Tag Along Tour 2D/1N is an amazing adventure on Fraser Island! In your own 4WD you will follow your guide around the island, visiting some of its best parts. You will stay at a beachside accommodation during your night on Fraser, spending your days driving from place to place alongside your fellow travellers. During your 2 day tour you will get to discover Fraser Island's most beautiful hidden treasures. Visit wonders such as Lakes Birrabeen, Allom and Boomanjin, which are visited by fewer sightseers, allowing you to explore at length with your fellow travellers. Your tour will take you to some of the island's most gorgeous parts during the day, with the night spent at the Drop Bears Beach House. This tour is a great way to explore the less travelled, getting to see the island in the best way possible! Premier Motor Service offers you the chance to explore Australia worry free! With routes running between Rainbow Beach, Noosa and Airlie Beach. 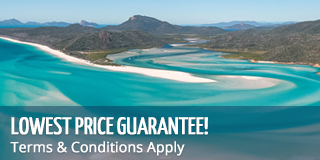 Premier is the perfect choice for travel between your Fraser Island and Whitsunday tours. Our team of travel experts will help you find the right departure to get you to your next adventure! *Please note: The Whitsundays and Fraser Island are over 900 KM apart, if you choose to make your own way please allow sufficient time to get to each destination.